Lynn has published ten children's books. These children's books are about kindness, helping others, and believing in yourself. See below for details and links. For her fiction and non-fiction books, please see the tabs above. Thank you! ​and becoming more than you ever thought possible. you can be so much more than you ever thought possible. These make great gifts for the holidays or any time - give your child the gift of reading - a gift that will last a lifetime! “Penny Gains Confidence” - Penny is a sweet gray-and-white bunny who was born with one hind leg shorter than the other. She is filled with self-doubt, and her feelings are hurt, as others make fun of her inability to keep up with the other bunnies. When she meets Cocoa, a sweet orange-and-black kitten with a crooked tail, everything changes. Together, they come face-to-face with their pain and insecurities, as they struggle to help each other. Can she learn to face her fears, stand up to bullies, and feel good about who she is? This story inspires us to treat others with kindness and compassion, and to see the best in each other and in ourselves. Join Penny as she attempts to find her courage and build up her inner strength and confidence. And as she does so, her whole perspective on life changes. Can she learn that she is valuable, worthwhile, and special just the way she is? Throughout this story, Penny discovers the joys of kindness and compassion. This is a sweet, uplifting, and empowering story, and a true celebration of life, as it inspires each of us to celebrate our differences, our imperfections, and our uniqueness, and to look beyond the surface to discover our true inner worth. It is filled with sweetness and gentle humor, and helps all of us learn that each of us is valuable, worthwhile, and important. We are inspired to love and treasure who we are, and to see the best in each other and in ourselves. We are reminded that helping and being kind to others is always the best way to be. Excellent book for teaching children about compassion, joy, love, life, kindness, and respecting differences – great to have in your child’s library. To order a copy at Amazon - click here! Ray and Roxy are two sweet and beautiful golden-yellow fish who enjoy the cool, refreshing water of the ocean. However, as they face various dangers and have life-changing experiences, they are forced to re-think everything that they know about life. They come face-to-face with their fears, perceived limitations, and what they used to think they knew about life. All of that changes for them in this story, where Ray and Roxy discover that life holds so much more than they ever thought was possible. “Wish Fish: Book 1 – Discovering the Secret” is where this exciting adventure begins! Join Ray and Roxy in this exciting and touching adventure. Can they escape dangerous large predators and avoid being captured by fishermen? What are these special abilities that defy logic and are beyond what they thought was possible? As they break through their fears and misconceptions about their own limitations, they discover a wonderful freedom and joy as they unleash their own inner gifts and abilities. This is both a love story and a celebration of life, an uplifting, loving, feel-good story helping all of us learn to treasure who we are. This book helps all of us learn to not hold ourselves back by old thoughts and fears and perceived limitations, but to open and find that we are so much more than we thought we ever could be. Although this story is written for children, the meanings under the story lines, and the layers and metaphors are really powerful and meaningful for adults as well, as the characters discover inner gifts, amazing possibilities, insights and wisdom, and realize that they are so much more than they ever thought was possible. This book is recommended for people of all ages, who would like their hearts touched by a sweet, uplifting story about discovery of the inner magnificence within all of us. Excellent book for teaching children about joy, love, life, and kindness – great to have in your child’s library. And don't miss out – the adventure continues with Wish Fish Book 2! Ray and Roxy are two sweet and playful golden-yellow fish who enjoy helping others in the beautiful expanse of the ocean. In this story, as they encounter various dangers and threats, they come face-to-face with new life-changing experiences and are forced to re-think what they know about life. “Wish Fish Book 2 – Endless Possibilities” takes off where Book 1 left off, and the exciting adventure continues here. In this story, they challenge their own fears, self-doubts, and insecurities, and what they thought they knew about life shifts dramatically. In this book, everything changes as Ray and Roxy help others while facing incredible new and terrifying dangers. How can they get away from the huge jaws of a monster fish? Can they possibly help another fish heal? Join them as they break through imagined limitations, learn from a Master, and unleash their true inner joy. And, in the process, they discover that the real possibilities are astoundingly endless. This is a beautiful and empowering story, filled with warm humor, which helps all of us learn to not hold ourselves back by outdated thoughts, fears, and perceived limitations, but to open and find that we are so much more than we thought we could ever be – and when we do that, the possibilities are truly endless. Excellent book for teaching children about joy, love, life, and amazing possibilities – great to have in your child’s library. And don't miss out – if you have not yet read the first book, the adventure starts with Wish Fish Book 1. 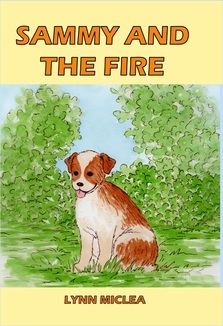 ​“Sammy and the Fire” is an uplifting, charming, feel-good story about a sweet rescue dog named Sammy who faces his fears and puts his own safety on the line in order to save the lives of his friends. Join Sammy in this exciting, thrilling, and dangerous adventure, as he discovers the true joy of helping others. Throughout this story, Sammy shows his loving and playful nature, his sense of humor, and his unique view of life. When Sammy smells smoke and realizes that something is wrong, he knows that friends are in danger and that he has to do something. Can he reach the burning home in time to save his friends? Join Sammy as he faces his fears and discovers the true joy of helping others while rescuing friends from a fire. This is a book about helping others and caring about the welfare of friends. It helps us want to make this a friendlier and more loving world. This book helps encourage all of us to care about others and to be kind, loving, and compassionate. This is a sweet and empowering story, filled with fun and humor, which helps all of us learn that helping and being kind to others is always the best way to be. Excellent book for teaching children about joy, love, life, kindness, helping others, and also about taking care of dogs – great to have in your child’s library. “Sammy Visits a Hospital” is an uplifting, charming, feel-good story about a sweet rescue dog named Sammy who has fun and brings smiles to others while exploring in a hospital. When Sammy is snuck into a hospital to visit Susie, he sneaks out of her room for some crazy and fun adventures. Can he help children laugh and feel better? What happens when he gets lost? Join Sammy as he discovers the true rewards of bringing joy to others while having silly and thrilling adventures in a hospital. Throughout this story, Sammy is his happy and lovable self, as he hides from the nurses and shows his loving and playful nature, his sense of humor, and his unique view of life. Filled with fun and humor, this story helps us learn that bringing kindness and smiles to others can help make this a better world for all of us. 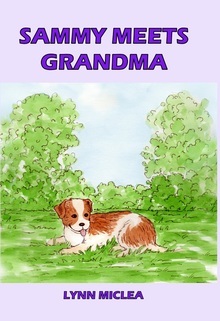 “Sammy Meets Grandma” is a fun and charming, feel-good story about the true joy of helping others. When Sammy is brought to a senior facility to meet Grandma, he discovers a whole new world in which to explore and play, while showing his loving and playful nature, his sense of humor, and his unique view of life. Join Sammy, who is at his silly, playful, and mischievous best. Can dogs dance? Is he able to catch a squirrel? Join Sammy as he has funny adventures while also helping and touching the residents there, bringing life and happiness to those who need it the most and making a huge difference in their lives. This is a sweet and empowering story, filled with fun and humor, which helps encourage us to reach out to others through simple acts of kindness, bringing joy and smiles to those whose lives we touch. We are reminded that we are all connected, and that by being our own unique selves and being there for others, we can make an amazing difference in the lives of those around us. ​To order a copy at Amazon - click here! “Sammy Goes to the Dog Park” is a thrilling, exciting, feel-good story, filled with much humor, and a true delight to all animal and dog lovers. When Sammy goes to the dog park, he has many hilarious, wonderful, and heart-warming adventures. Join Sammy, who is mischievous, silly, and playful, as he races the big dogs along a fence and sings with the dog choir. Can he help a scared new dog? Can he find a missing friend? Throughout this story, Sammy is his most lovable and funny self, as he helps others while bringing joy to everyone around him. This is a sweet, uplifting, feel-good story that encourages us to be compassionate and caring, and to do as much as we can to help those around us, whether animal or human, and to be kind, loving, and gentle with everyone we meet. Filled with fun and humor, this story encourages us to feel good about who we are, and to treat all living beings with kindness and respect. Excellent book for teaching children about kindness, compassion, helping others, and also about taking care of dogs – great to have in your child’s library! “Sammy Falls in Love” is a thrilling and sweet story, filled with excitement, danger, and humor. This is about a sweet rescue dog named Sammy, who discovers a new buddy with whom he has many scary and heart-warming adventures. Join Sammy, who is mischievous and playful, as he makes new friends. Who is hiding in his doghouse? Can he save a boy who fell into a lake? Sammy puts his own safety aside as he helps others, while being his happy and silly self, bringing joy to those around him, as he falls in love. This is a sweet, uplifting, feel-good story that encourages us to be kind to everyone and reach out and help wherever we can. It shows the value of making new friends and caring about others. Through this story, we are inspired to make deep connections with friends and family, and to treasure those who are in our lives. Filled with courage, fun, and humor, this story is a celebration of life, as it brings out the joy in our experiences and in our relationships. We are all encouraged to be kind and to help others as much as possible. When we show kindness and compassion to those around us, we may find that love is right under our whiskers. Excellent book for teaching children about love, connections, kindness, compassion, helping others, and the joy of life and love – great to have in your child’s library. “Sammy and the Earthquake” is a thrilling and exciting story filled with danger and suspense, about a sweet rescue dog named Sammy who does his best to help others after an earthquake. ​When the ground shakes and people need help, Sammy rushes to help them. Can he help rescue a woman trapped under a fallen dresser? And what crazy mischief is the lady's cat up to? Can he help a man who needs assistance reaching his baby girl and two small puppies? ​Join Sammy in this exciting, thrilling, and dangerous adventure as he puts aside his own fears and safety while doing his best to help his neighbors. This is an uplifting, feel-good story about reaching out and helping our neighbors. We are all encouraged to make a difference in this world by being kind and caring about those around us. This is a fun and empowering story, filled with sensitivity and humor, which inspires us to be compassionate, and to always be kind to others. Excellent book for teaching children about love, compassion, kindness, and helping others – great to have in your child’s library. “Sammy Goes On Vacation” is an exciting and thrilling story about a sweet rescue dog named Sammy who goes on his first vacation and has lots of fun and dangerous adventures. What does he think of the beach and the ocean? Can he save a little girl from a scary and dangerous snake? Can he stop a bank robber from robbing a bank? Who does he play with in the woods? Join Sammy in this fun, exciting, and dangerous adventure as he is his silly and lovable self, having the time of his life, while showing a lot of courage and helping those around him. This is a charming, fun, entertaining story about courage, kindness, and helping others wherever we are. ​Filled with a lot of excitement, fun, and humor, this story touches us and inspires us to always do the right thing and to be kind to everyone, which really makes the world a whole lot better. Excellent book for teaching children about courage, fun, kindness, and helping others – great to have in your child’s library. and they make excellent birthday and holiday gifts for children of all ages.